On Tuesday I shared a recipe for Slow Cooker Chicken Philly Sandwiches. I also promised you a great way to use up the leftovers. 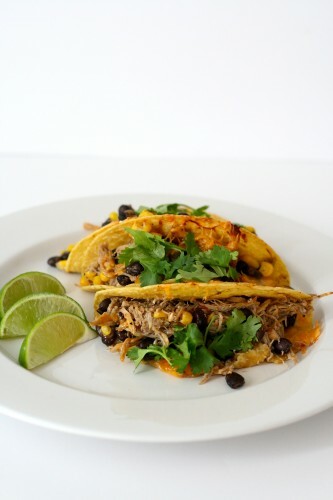 These baked tacos are the BEST way to transform these leftovers into something different. What is your opinion on leftovers? Love them? Hate them? I am sort of lukewarm when it comes to leftovers. Lasagna is about the only leftovers that I get really excited for. Have you ever eaten day old lasagna before? So good! Dare I say it is even better than fresh from the oven. 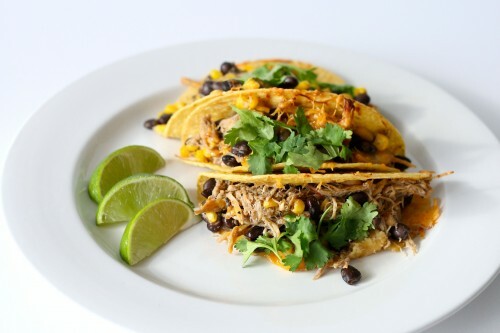 Transforming leftovers into something new makes them ten times more appealing. That is what I did with the Chicken Philly Sandwiches. They were totally appealing on day one, fresh from the crockpot, slightly less appealing on day two when I had a leftover Philly for lunch, and by day three I just couldn’t stomach the idea of another sandwich. So I popped the leftover chicken into the freezer to pull out on a busy night. Last week I was so thankful when I opened up my freezer and saw the frozen Chicken Philly meat. We didn’t have any hoagie buns so I opened up the pantry to see what we did have. Tacos shells. Tacos shells are a pantry staple in my house. I also knew I had some leftover sweet corn in the fridge and a can of black beans (another pantry staple). 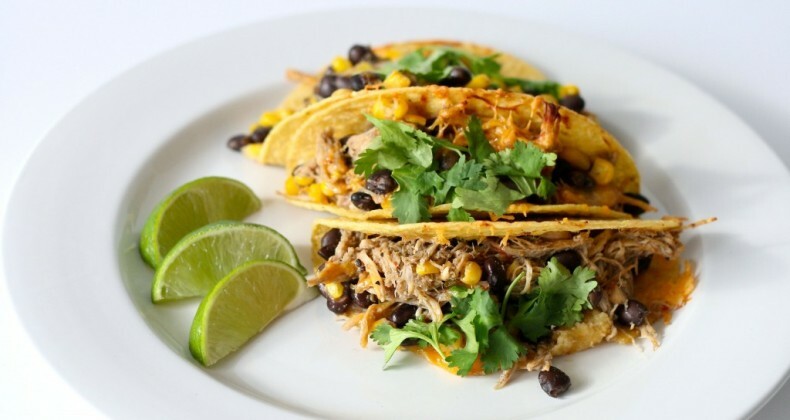 The Chicken Philly meat got a makeover and out came these sassy Chicken, Black Bean, and Sweet Corn tacos. Last year I posted a similar recipe for Baked Tacos. Tacos must be a Labor Day thing for us. No leftover chicken? No problem! You can substitute 2 cups cooked shredded chicken or 2 cups Rotisserie chicken. 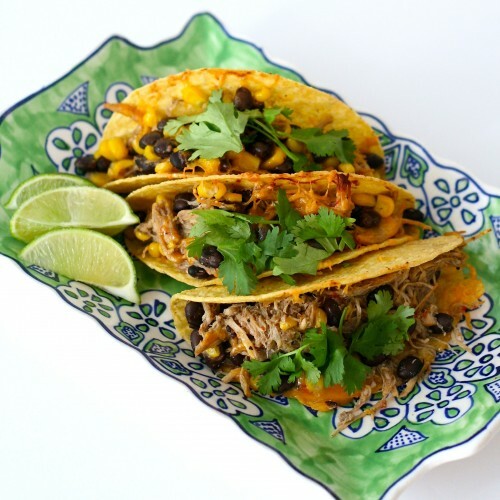 I would add in 1/2 cup salsa or 1/4 cup chicken broth to give the taco filling a little extra moisture. Ole! In a medium mixing bowl stir together chicken, beans, corn, and cumin. Divide mixture between 10 taco shells. Stand tacos shells in a 9x13 baking dish. Sprinkle each shell with a little cheese. Our family loves tacos, but my biggest complaint is that one of us is standing at the stove filling tacos, rather than sitting at the table. Although I have made many a baked dish with soft tacos, baking hard shells has never occurred to me. This is a recipe I will definitely be trying! It really does make for a quick dinner if you already have cooked chicken. Enjoy! 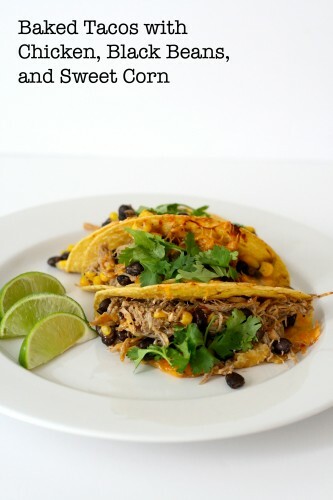 What brand of corn shells do you use in this recipe? Hi Judy! It depends on which store I am at and what I grab. These used in the recipe are Old El Paso brand. However I have used the one generic store brand ones too.